"Miami township has been rejected, owing to a mistake in the date of the poll-book, it being dated 1820 instead of 1822." Liberty Hall and Cincinnati Gazette (Cincinnati, OH). 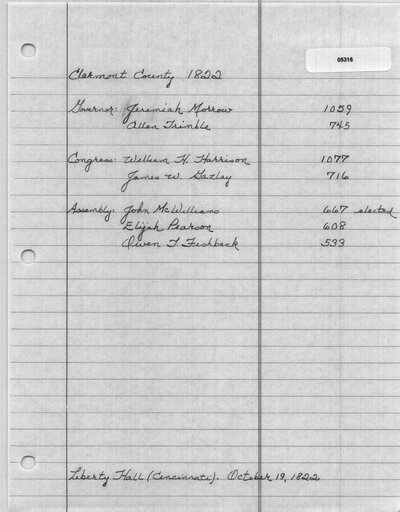 The Western Monitor (Lexington, KY) lists James W. Gazlay with 2426 votes and William H. Harrison with 1747 votes. Liberty Hall and Cincinnati Gazette (Cincinnati, OH). October 12, 1822. Inquisitor Cincinnati Advertiser (Cincinnati, OH). October 15, 1822. Liberty Hall and Cincinnati Gazette (Cincinnati, OH). October 16, 1822. Western Monitor (Lexington, KY). October 18, 1822. Liberty Hall and Cincinnati Gazette (Cincinnati, OH). October 19, 1822. Western Spy, and Literary Cadet (Cincinnati, OH). October 19, 1822. The Supporter and Scioto Gazette (Chillicothe, OH). October 23, 1822.